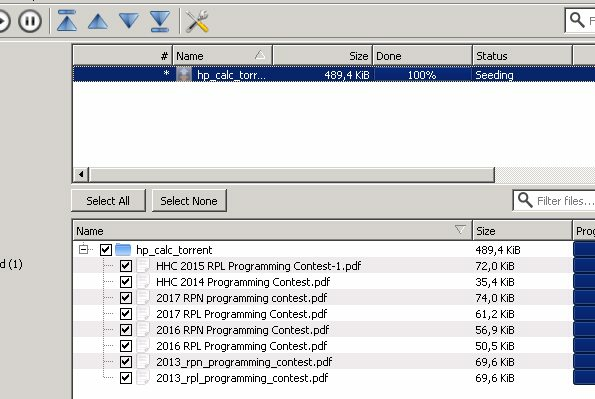 Does anyone know where to find a collection of HHC programming contests? Even if only the last 5-10 years. Or does anyone has them somewhere? Could they be shared? Are those in the Jake Schwarz's collection? Update: let's slowly create a torrent shared via trackerless magnet link. At first files are shared in a flat directory. Order will be made when they will be plenty. "find . | sort -n"
Thanks Didier! Knowing the museum usb stick and Jake schwarz work, I was thinking that such publications were already in a collection of documents. So, as discussed in another post. I believe that sharing a torrent that includes publications, discussions, etc.. interesting for the HP calculator community is worth it. Of course, every big project starts small or does not start at all. Therefore I quickly went through the site using google collecting as many HHC programming contests pdf I could, but many hosted by Gene Wright on dropbox are not reacheable. The results (small, but it is a start) are packed in this torrent. if you want to contribute. Download the last version of the torrent (I will slowly make a thread about it with the last version in the first post), expand it, create a new torrent, share the magnet link. You can also contribute simply with a better file organization and naming convention. Or upload them on the http://www.wiki4hp.com . Or upload them on internet sites that hold them for 30 days, so I can pick them in time. The idea is: if it is shared, it has less chances to get lost. For torrent, I suggest qBittorrent, it is very handy and open source. Someone picked up the magnet link already! Nice! Keep sharing! what is nice to know if there are more pdf available somewhere, maybe from your disk? More info in the first post. reordered files and added some (now we are on 32 mb). Suggestions on what to add are welcomed. Adding things "just for the sake of adding" makes not enough sense for me, so a recommendation will help. For a moment I though yesterday I was drunk. Half of the work done was not there. Somehow it got deleted (I guess I am not yet that used with double commander and its selection) but the recycle bin of the qnap saved it (note: it works only with samba shares). So updated the first post, that actually should have been so already yesterday. Once again: if you have seen a useful document or program or library, please at least tell me (plus the working source, like hpcalc.org and a short description unless the content is a document) so I can have a chance to put it in the p2p archive. If you want to publish an up to date archive with new content or reorganize contents, just do it. See the readme in the collection. 2014 was Joe Horns. Blame for the rest belongs to me. Before 2012, I was participating not judging. That was Joe. (09-19-2017 09:03 PM)Gene Wrote: ..
Added (actually there is a bit of overlap in the files but I was lazy for the moment). If Joe (Joe H. ?) can contribute with his collection, it would be super welcomed! Also you need to have secure connection (encryption mode: required) and open ports (the DHT works with UDP, if you are behind nat, it does not work well). So far at least 3 different IPs were able to download the release from yesterday. The new ones are really fresh so no one asked so far. Some old torrent releases (older than 3 days) are invalid, because I changed the folder structure. edit: also sharing via dht is not immediate, it takes a while to be propagated and reachable. (09-19-2017 09:22 PM)pier4r Wrote: If Joe (Joe H. ?) can contribute with his collection, it would be super welcomed! A thorough scan of my hard drives (old and new) only found 4 contests (2004, two in 2010, and 2014), and the submitted RPL entries for the 2010 contest. Hopefully, some of these were still needed. Thousands thanks Joe and Jake! Since at least a short description is needed, then maybe you can start with little suggestion of 1 or 2 resources every now and then. Because I know that linking a resource is easier than linking and adding a description. Various HP Calculator programming forms. I've got a Raspberry Pi running Transmission and there has been some activity on the magnet link. (09-24-2017 10:19 PM)Craig Bladow Wrote: Various HP Calculator programming forms. Nice, I'll add asap (likely tomorrow). Can you give a short description of the forms? What is their purpose? If you want, you can add them and share the magnet link, it will be the same. These are scans of the paper forms users would use to document their calculator programs and could be use to share the program with a friend or submit it to a user library. Contains forms for HP-35, 45, 55, 25, 65 and what looks like a combined HP-67/41 form. I'm not sure where this should go in the archive so I'll let you decide. Please disregard any idiomatic error. As usual, suggestion about what to add are welcomed. I could just add random entries from hpcalc.org but it would make little sense because I could not really recommend them for anything since I did not use them. So recommend what you use! Also don't mind about where to put files, if you want to release a new version by yourself, refactoring can always happen. For example I don't mind much when I create folders, as they can be changed later.